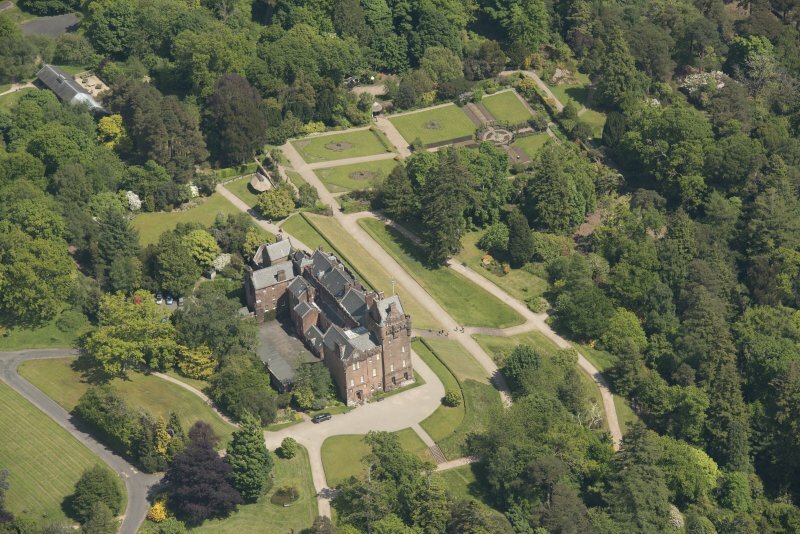 General oblique aerial view centred on the country house and walled garden, taken from the ENE. 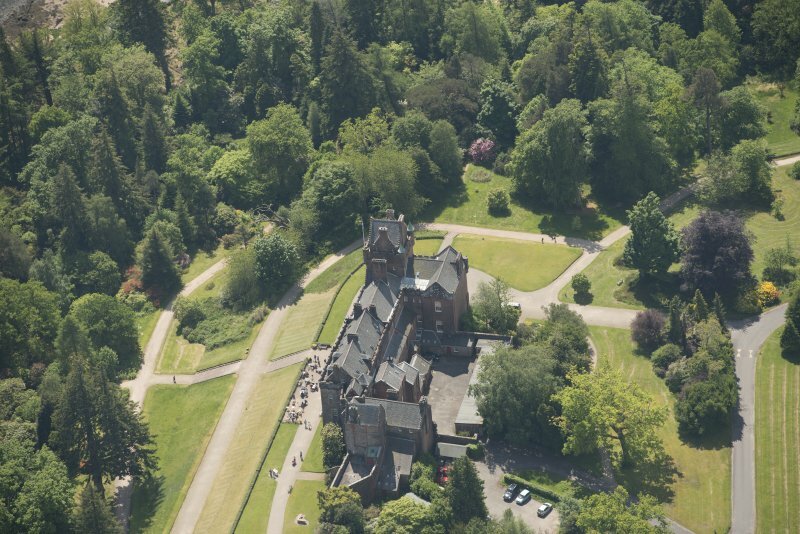 Oblique aerial view of Brodick Castle, looking to the NNW . 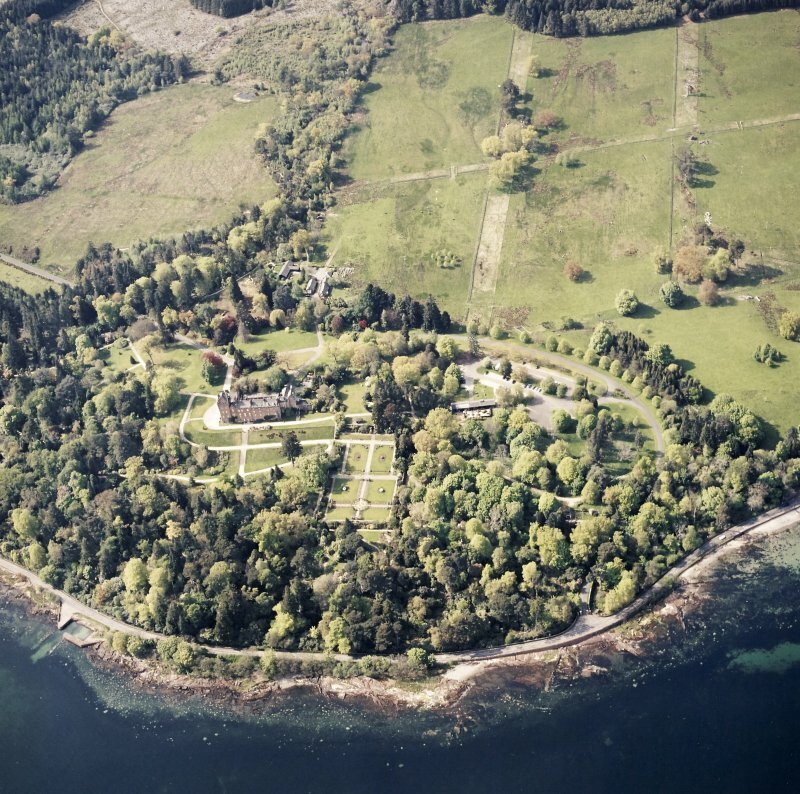 Oblique aerial view of Brodick Castle and walled garden, looking to the SE. 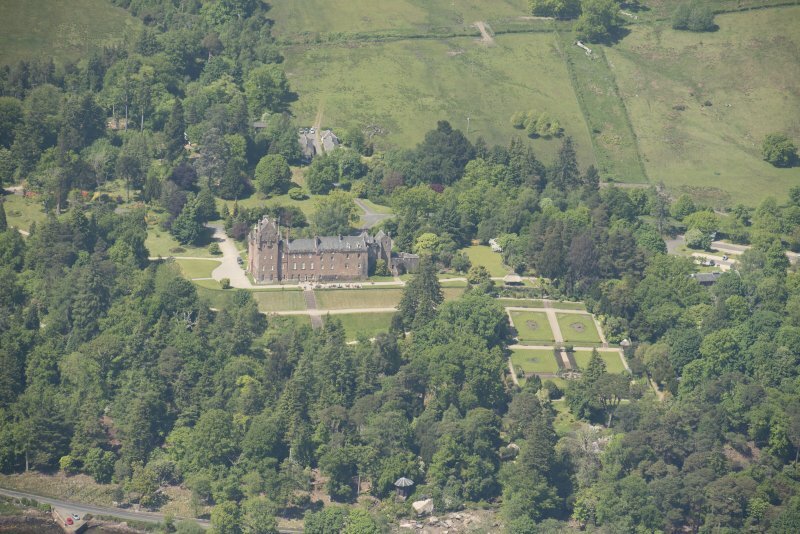 Oblique aerial view of Brodick Castle, looking to the SSW. 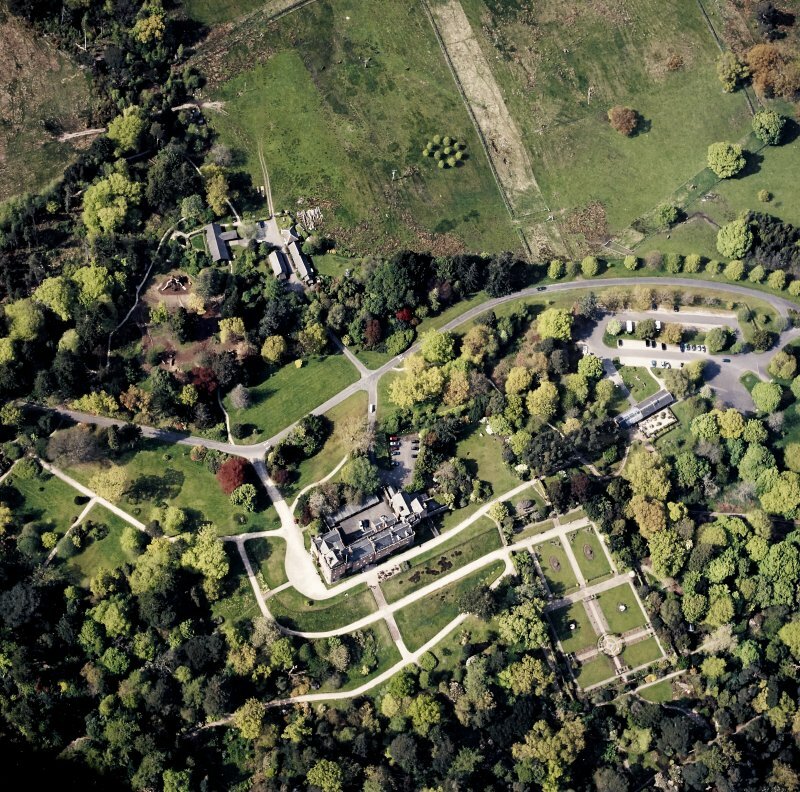 Oblique aerial view centred on the country house, walled garden and cottages, taken from the SE. 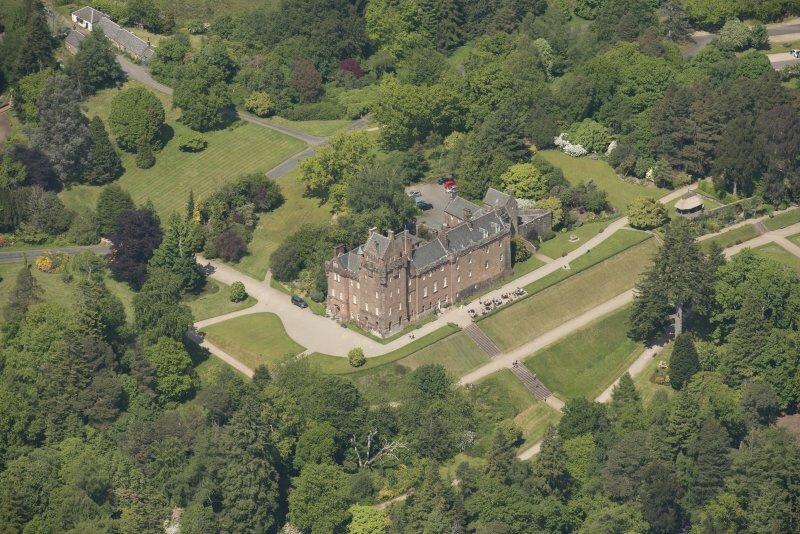 Oblique aerial view of Brodick Castle, looking to the NE. 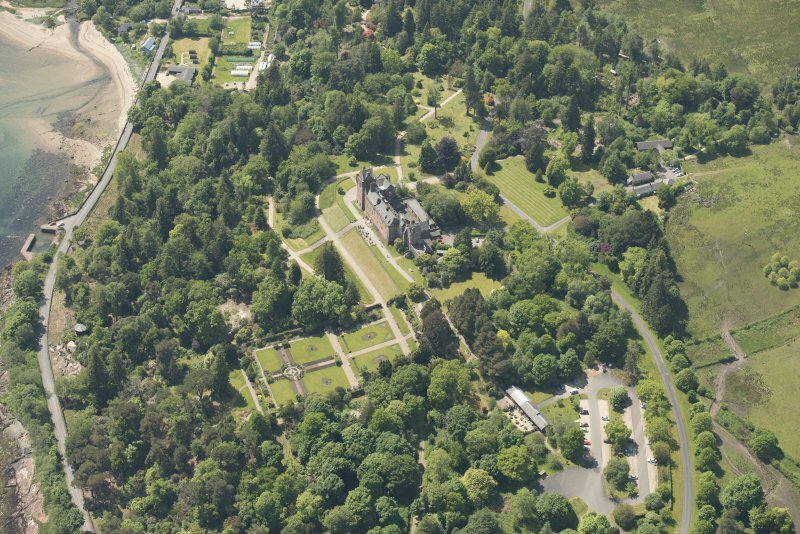 Oblique aerial view of Brodick Castle, looking to the S.
Oblique aerial view of Brodick Castle, looking to the NW. 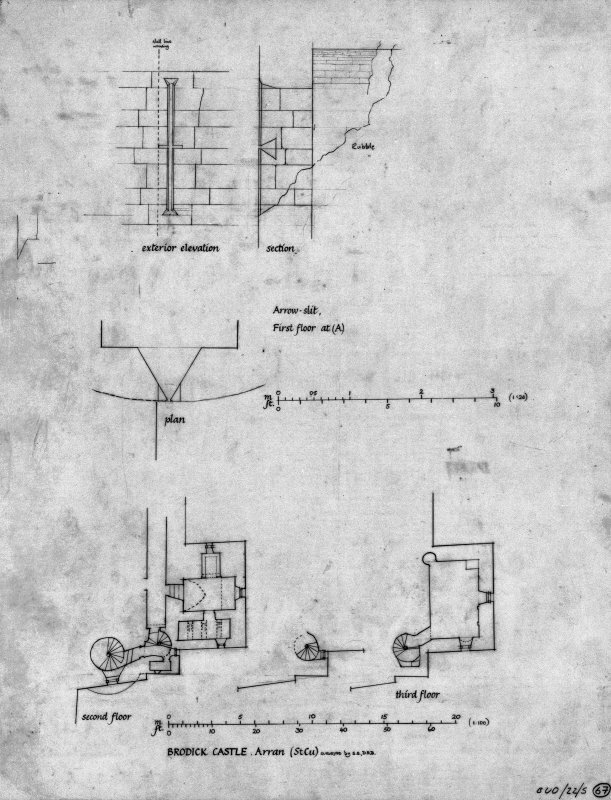 Scanned image of drawing showing part plans second and third floors with details of arrow slit. 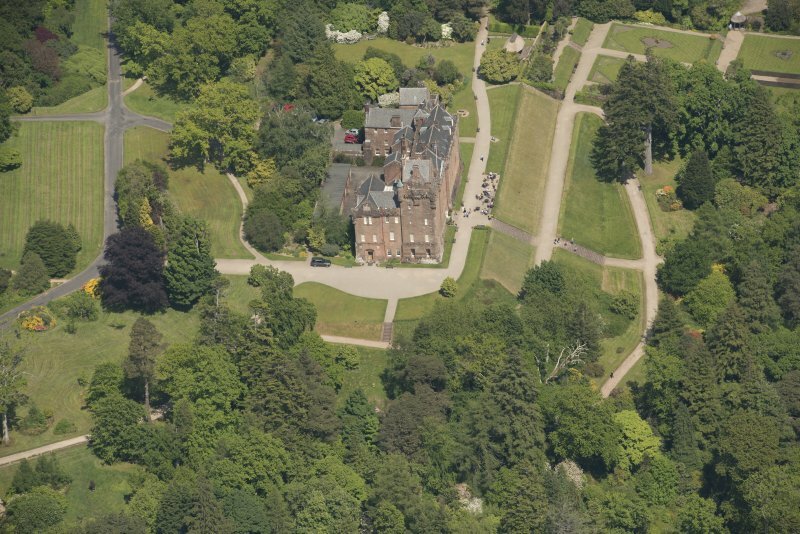 Oblique aerial view centred on the country house, walled garden and cottages, taken from the SSE. 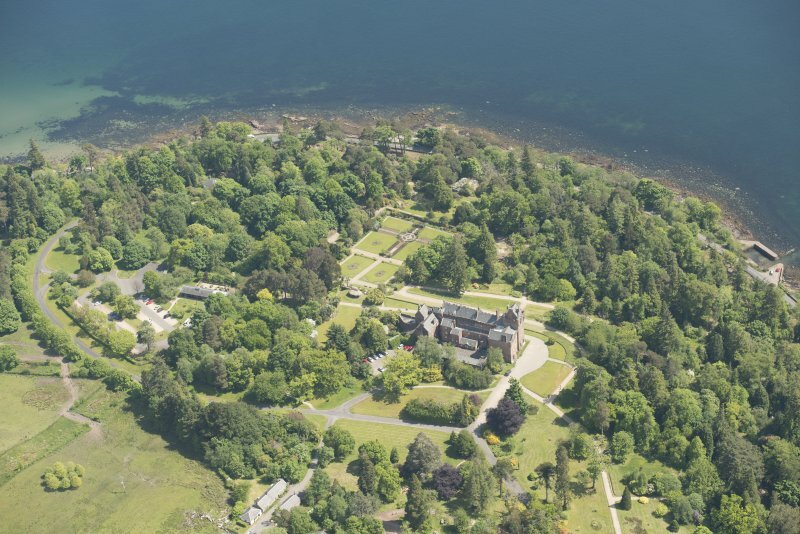 General oblique aerial view centred on the country house and walled garden, taken from the E.
General oblique aerial view of Brodick Castle Estate centred on the castle, looking to the NW. 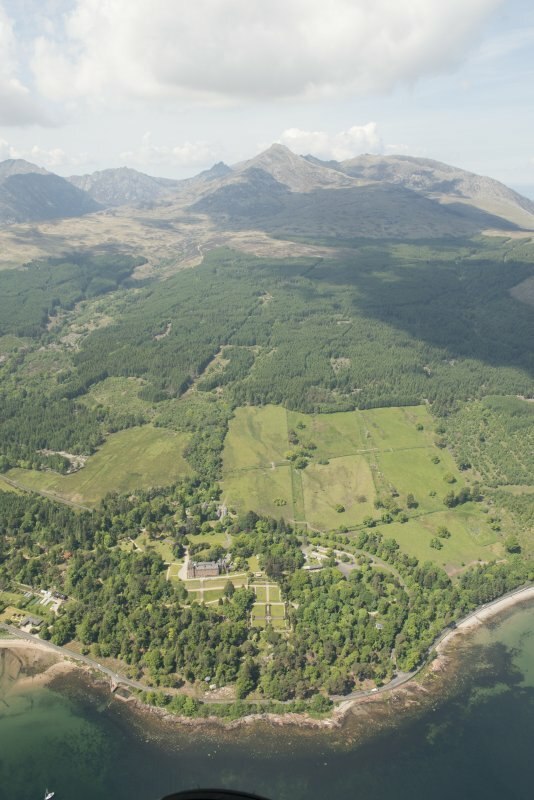 Oblique aerial view of Brodick Castle and walled garden, looking to the SW.
Oblique aerial view of Brodick Castle, looking to the E.
General oblique aerial view looking across the country house and walled garden towards Goatfell, taken from the SE. 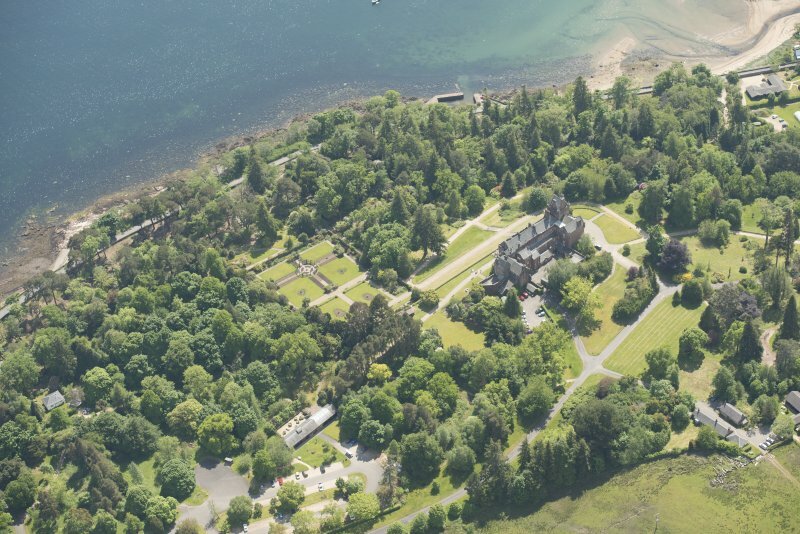 Oblique aerial view of Brodick Castle, looking to the WNW. 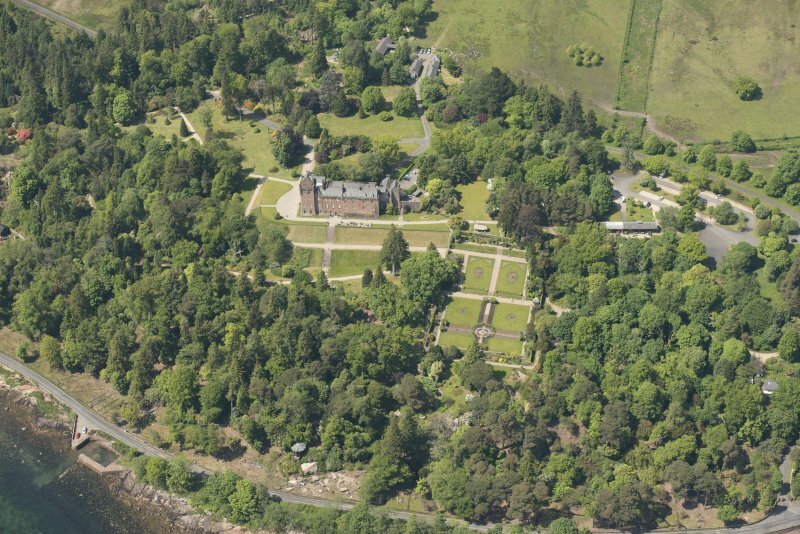 Oblique aerial view of Brodick Castle and walled garden, looking to the NW. 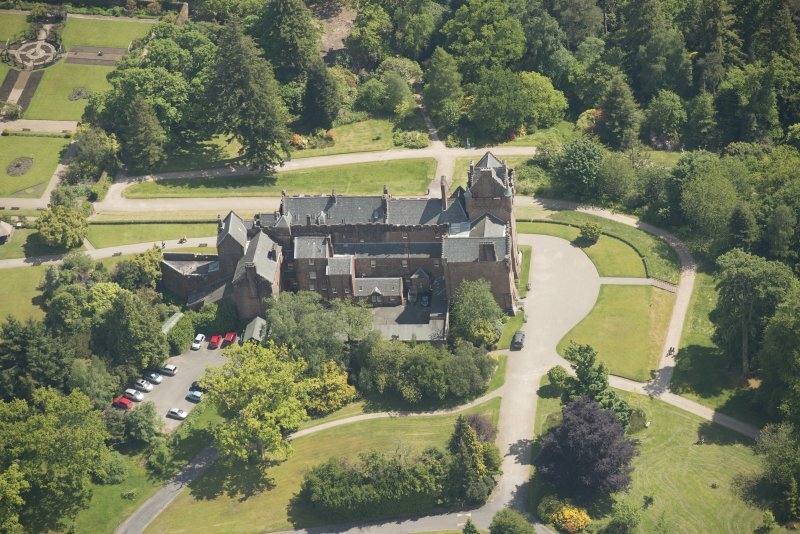 Oblique aerial view of Brodick Castle, looking to the N.
Scanned image of drawing showing part plans of ground floor and first floor at East end. 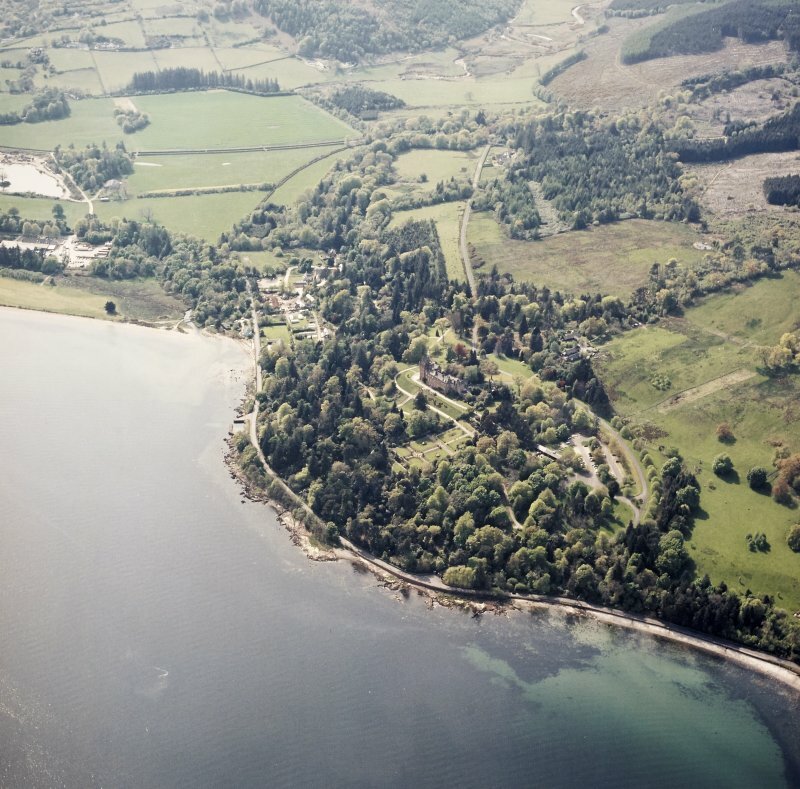 General oblique aerial view of Brodick Castle and Old Quay, looking NE. 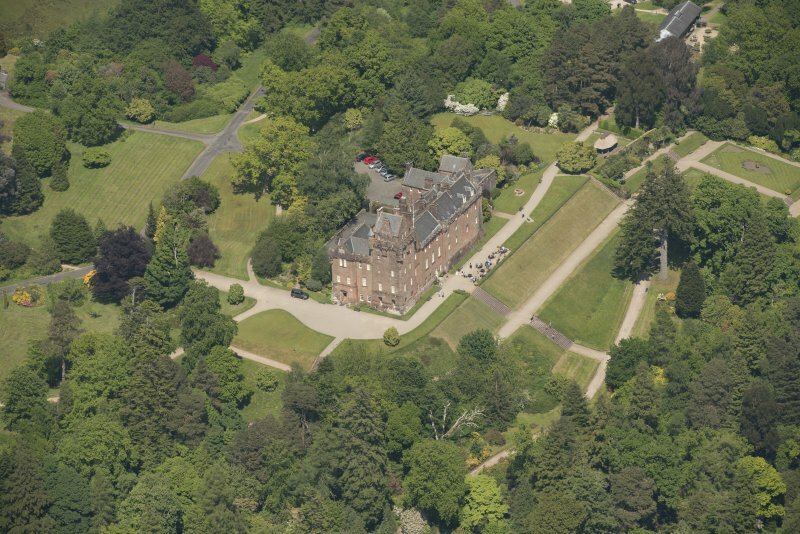 Oblique aerial view of Brodick Castle, looking to the SSE. 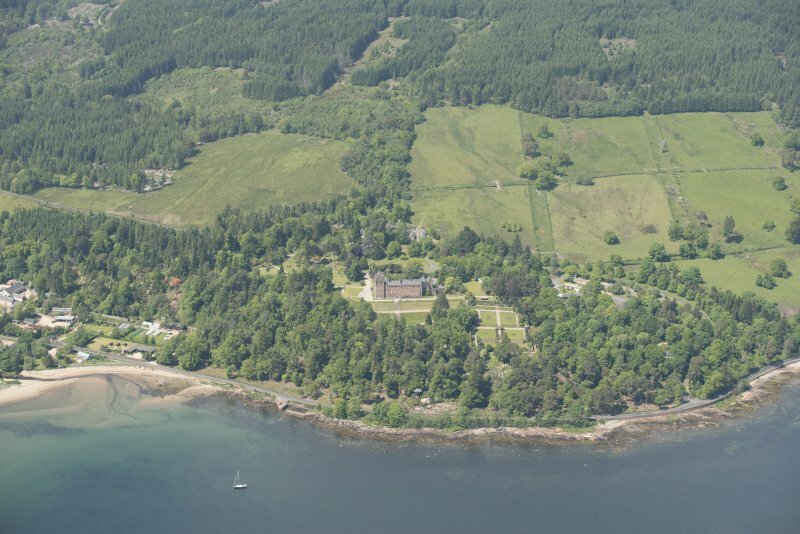 General oblique aerial view of Brodick Castle estate, looking to the NW. in the lower storeys, consist of a long main block lying E-W of three storeys and an attic, surmounted by a crenellated parapet and walk, and a slightly taller square tower projecting E. Added to this is a low battery for cannon, erected by Cromwell's troops in 1652 and extending E. The original entrance was to the E, beside Cromwell's battery. The site occupied by the castle was allegedly a Viking Post, later taken over by the Lords of the Isles. 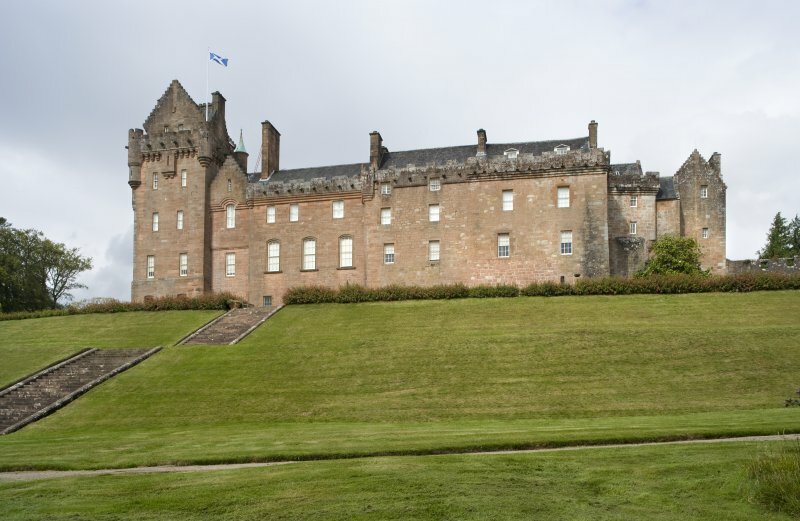 Passing to the Stewarts, the castle was twice sacked by the English in the 14th century, burned again in 1528 in feuding with the Campbells and Macleans, and again by the Earl of Lennox. D MacGibbon and T Ross 1887-92; N Tranter 1962-70; R McLellan 1970; R Prentice 1976; C Hartley et al 1987. 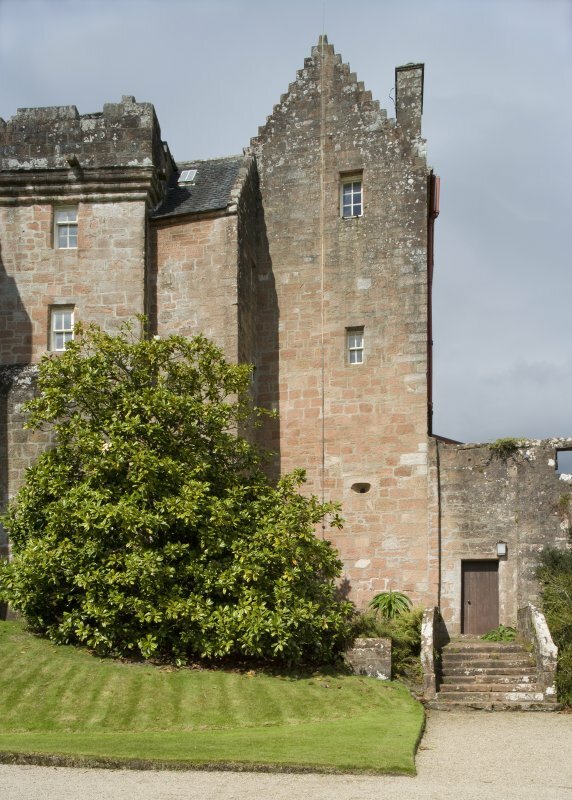 Examination of walling now within Brodick Castle has revealed an arrowslit, comparable with those at Skipness Castle, datable to the turn of the 13th-14th century. Information from J G Dunbar, RCAHMS to OS, 23 May 1977. 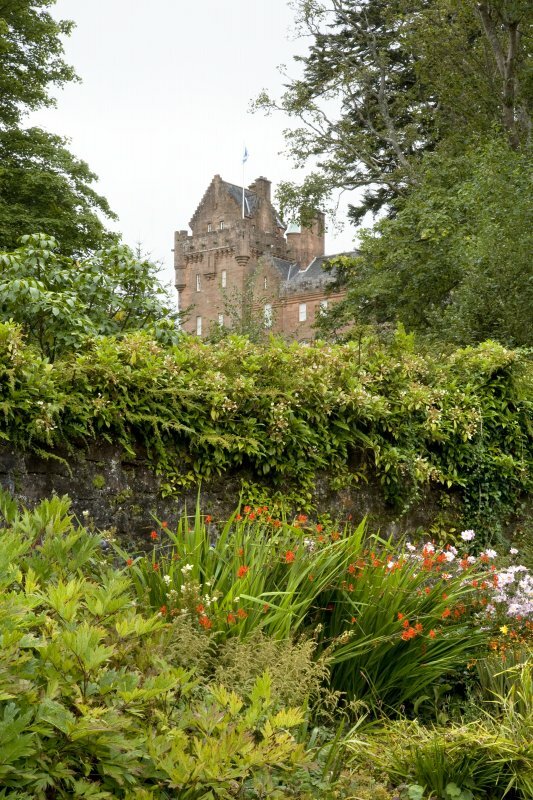 Brodick Castle (name confirmed) is generally as described above. The window noted by Dunbar is in the scullery attic and is not easily accessible. Visited by OS (T R G) 23 November 1977. A small scale excavation in the courtyard of the castle was undertaken by GUARD between 9 and 13 November 1992 in advance of drainage work. Below the tarmac covering the courtyard lay an infill layer of debris redeposited following previous work on the drains. This covered several different phases of drainage pipes cut into the red sandstone bedrock. Worked sandstone blocks were recovered from the infill layer, but their provenance is difficult to determine in the face of consecutive improvement building phases where new stone was deliberately chosen to blend in with the old. 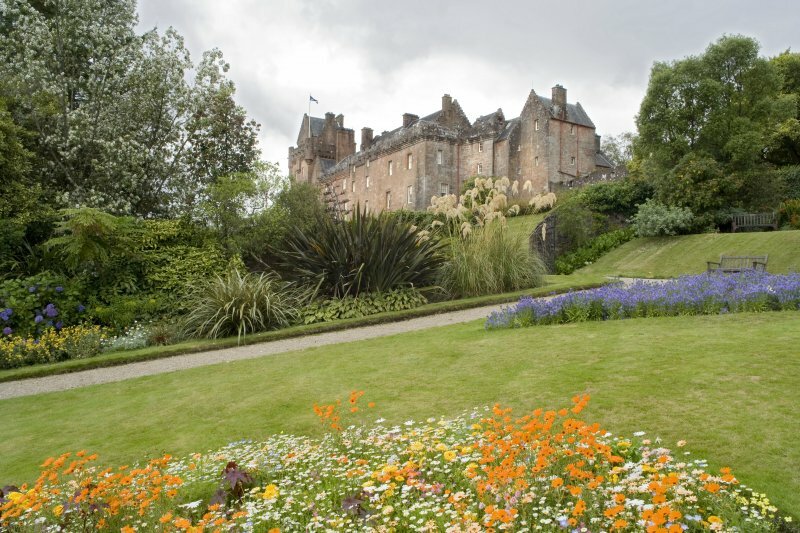 It is suggested that both modern disturbance and improvement work around the castle in the 19th century has destroyed all traces of earlier features, and that medieval material from this area is probably re-deposited elsewhere in the castle grounds. 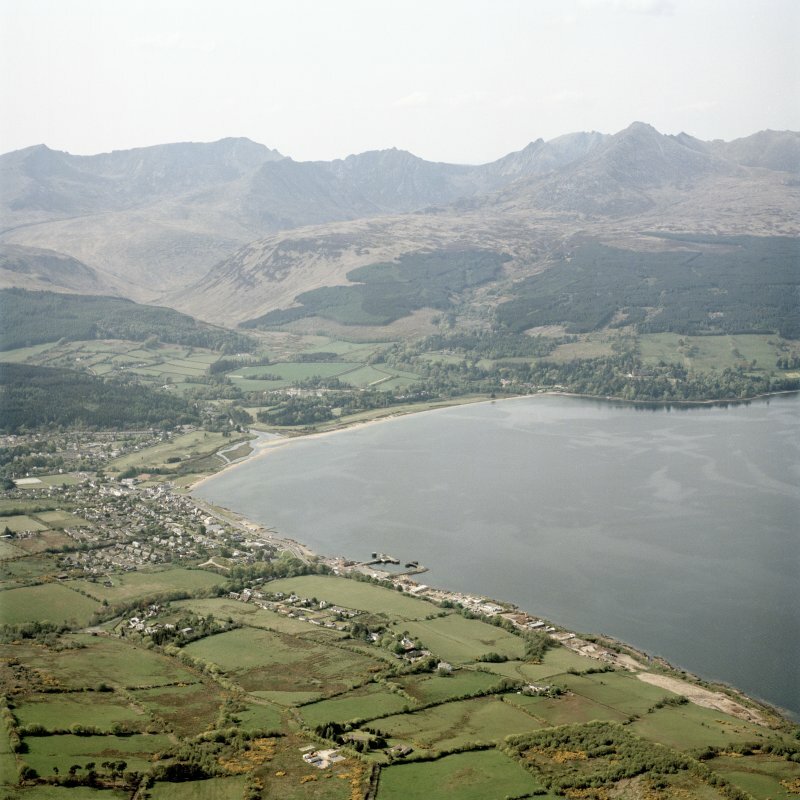 NS 0155 3786 A geophysical survey at Brodick Castle (NMRS NS03NW 2) was undertaken in June 2001. The survey aimed to locate the ditches that defended the original 13th-century castle on the site but which were filled in during the 19th century. 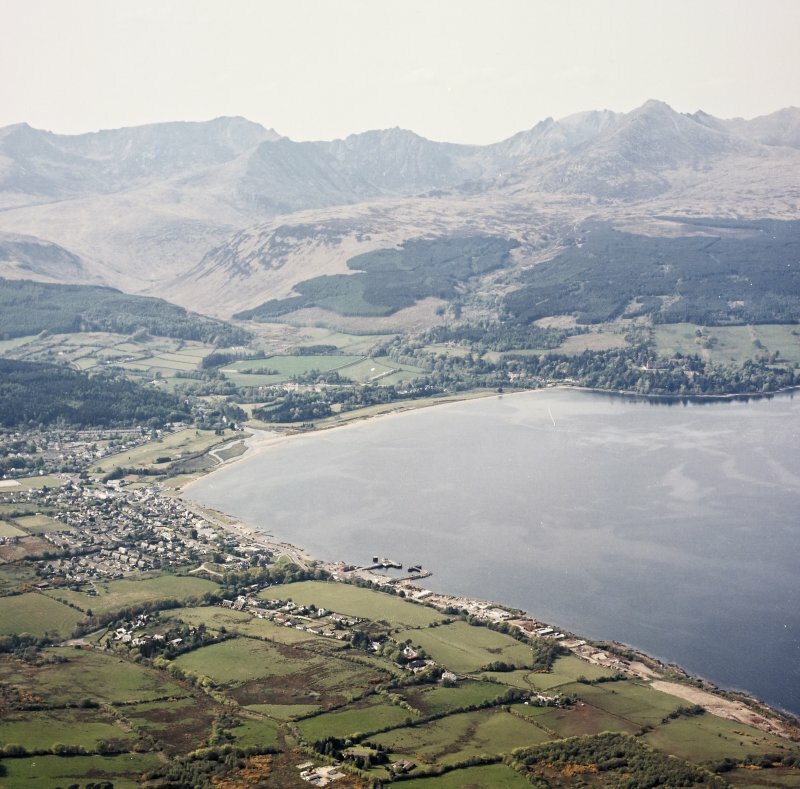 It was also hoped that the technique used would allow a 3-dimensional model of the bedrock around the site to be constructed, and possibly locate any remains which may be associated with a 'secret tunnel' that tradition says linked the castle to the shoreline. The work was conducted using a Wenner array capable of producing resistivity profiles down through the soil. 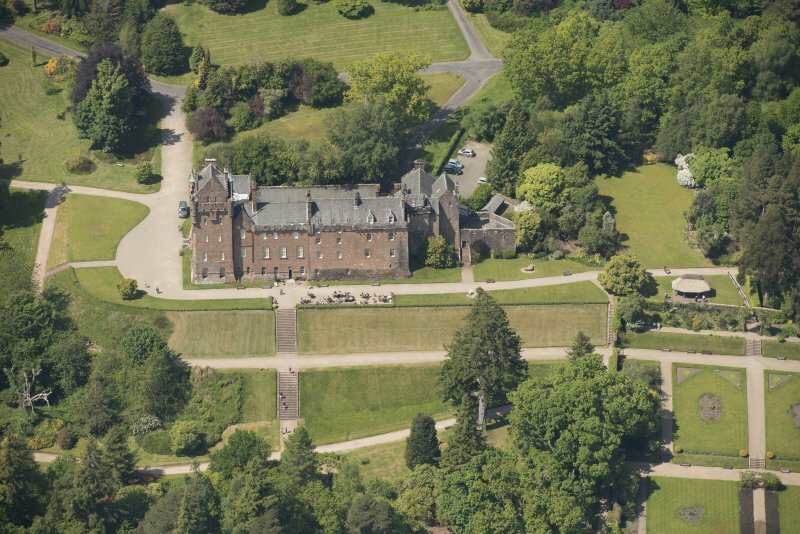 Around 24 transects of different lengths were surveyed around the castle but focused on the flat area to the NW, outside the castle courtyard, and on the garden terraces to the SE. Initial results look promising, with the line of a wide ditch possibly being located to the NW. Sponsors: National Trust for Scotland, University of Edinburgh. D Alexander and J Farrer 2001. NS 0154 3788 In a follow-up to the geophysical survey previously undertaken (DES 2001, 69-70), two trial trenches were excavated in April 2003 in a gap between the planted garden area to the W of the 19th-century courtyard wall at the rear of the castle. What appeared to be natural subsoil, a reddy-orange clay, was located 1.2m below the surface. Although the depth reached was limited, there was no clear evidence for the infilled castle ditch at this point, and it either lies closer to the castle or further W. Worked sandstone blocks may have derived from the medieval castle, but the ground was levelled in the 19th century and the area used as tennis courts. The finds from both trenches reflect this and include much 19th and 20th-century material, although there are a few sherds of medieval green-glazed oxidised ware. NS 0151 3791 Investigation of a collapsed area on the grass lawn to the W of Brodick Castle revealed a well-built sandstone drain aligned NNW-SSE. A 1.5 x 1m trench was cleaned up around the collapse. The drain was covered by large sandstone capstones but in one area three wooden planks had been used as an inspection hatch. The drain was rectangular in section, 0.42m wide and 0.45m deep. The walls were built of three to four courses of sandstone and in places were mortared. Looking along the drain, clay drainage pipes could be seen leading into the main channel. No artefacts were recovered. The construction of the drain probably dates to the late 19th or early 20th century. NS 0134 3783 An elongated, boat-shaped hollow, 6m long NE-SW by 2.7m wide and up to 0.9m deep, is cut into a natural bank on the E side of the Claddach Burn, 200m W of the entrance to Brodick Castle. Prior to excavation it was believed to be either a lime kiln or a small quarry scoop. An area, 3.5 x 3m, was cleared of vegetation in April 2003 above the inner end of the hollow and the base was excavated out. A further small trench, 2 x 1m, was excavated S of the entrance. The excavation confirmed that the hollow was a clamp kiln for producing lime. Removal of vegetation along the sides revealed stone walling that had clearly been affected by intense heat. The base was found to be 1.6m below the top of the side walls and consisted of bedrock. Above the base were layers of burnt coal and lime. Also in the base of the kiln was a stone-built flue, with a central channel 0.1m wide by 0.15m high. This flue extended into the section and may continue for the entire length of the structure. Unfortunately very few diagnostic finds were recovered from secure contexts, so the date of the kiln remains unknown. NS 0144 3813 A trial trench was excavated in the Castle Park fields at their SW end. 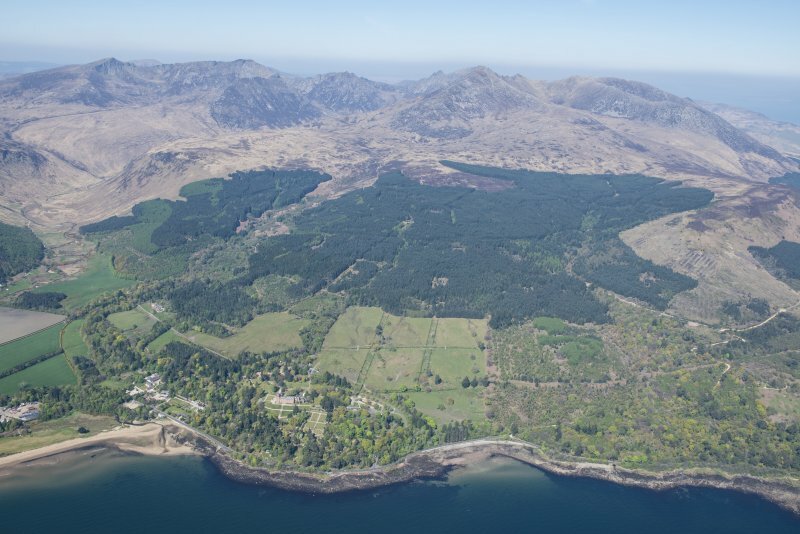 Prior to excavation a survey was undertaken of three banked hollows that were thought either to be small quarries, or activity associated with the former farmstead known as Dykehead, marked on Bauchop's estate plan of 1811. Each of the hollows is cut into the SE-facing hill slope and there is mound of upcast material on the downhill side. A small trench, 2 x 1m, was excavated across the eastern end of Hollow A. Below the topsoil was a compact, gritty, medium-brown, silty clay which contained fragments of brick and other recent artefacts. Throughout the trench there was evidence of tree root activity, and the hollows are probably tree throw holes. NS 0155 3789 The foundations of the early 20th-century courtyard wall at the rear of the castle were investigated in March 2004. Severe cracking is visible in the walls on either side of the gateway, the cracks suggesting the wall foundations were built upon unconsolidated material, possibly an infilled medieval ditch. Using a mini-digger, a trial trench was excavated in the middle of the courtyard entrance. Below the layers of road make-up and pipes were clear traces of the inner edge of a ditch. The natural boulder clay subsoil shelved away steeply precisely in line with the cracks in the wall. The presence of pipes and the proximity of the walls prevented further excavation in this area, but a new trench was dug by machine 10m to the NW of the first. This second trench was excavated to a depth of 1.6m without hitting subsoil, and was filled with a mixed layer of sandstone rubble and mortar. This must have been close to the middle of the ditch, and was full of demolition material from the old castle. The natural subsoil was located further to the W again and indicates that the ditch must be at least 20m wide. NS 0134 3783 Further excavation was undertaken in July 2004 on the clamp lime kiln discovered last year (DES 2003, 97-8). A further five trenches were opened. The first was at the entrance to the kiln, and the second was in front of the entrance. The remaining three trenches were placed around the top of the kiln, running outwards from the wall across the natural bank into which the kiln was cut. Excavation showed that the flue discovered last year continued for the entire length of the structure. The intensity of the heat achieved was evident in the burnt soil and scorched pottery found in the trenches around the top. Quantities of limestone and patches of lime were revealed. The artefacts recovered from the kiln, mainly pottery, indicate that it dates to the mid-19th century. Sponsors: NTS Thistle Camp, Total E&P UK plc. 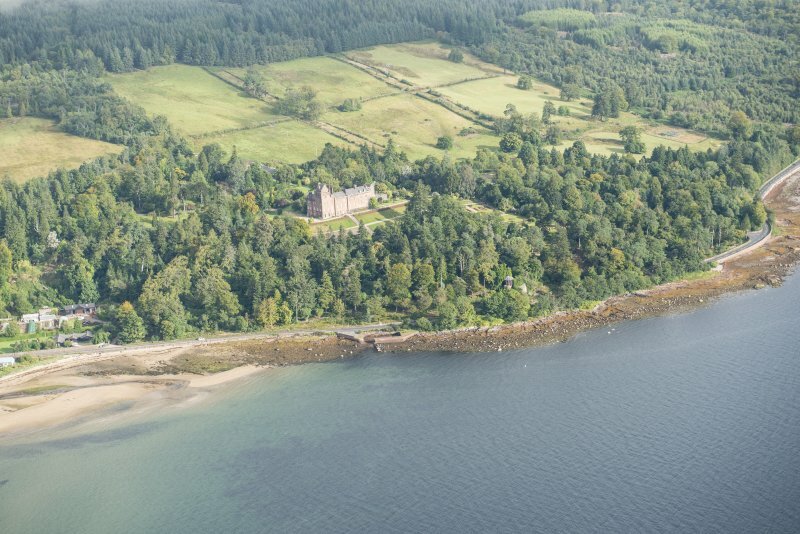 NS 0155 3786 A systematic analytical survey and record of Brodick Castle was orchestrated during March to September 2006 in conjunction with Derek Alexander, NTS Archaeologist. 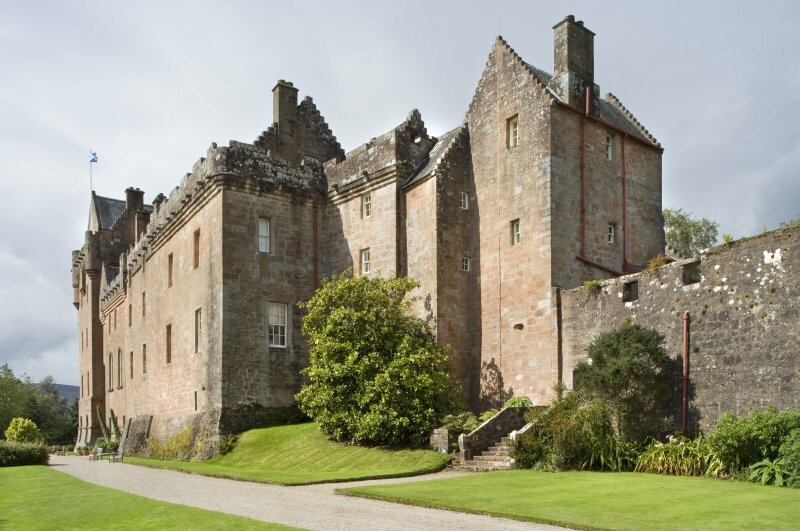 This 90-room structure was the principal fortress and residence of the Earls of Arran, later Dukes of Hamilton, and Duke of Montrose in the Isle of Arran, partly medieval and early post-medieval, and partly a baronial country house of the 1840s and later. Survey involved complete exterior and internal room-by-room elevation drawings; the survey was controlled internally by an EDM framework and externally by a laser-scanned imagery compiled by Alistair Carty. Internal details such as carved fire surrounds and heavily moulded plaster ceilings were also laser-scanned at high resolution. A systematic feature-by-feature context record and photographic survey of the structure was accumulated and an analytical account of the structure written. An extensive historical assessment of earlier historical material in the Hamilton family archives and elsewhere was undertaken by Dr Richard Oram. Later material (post-1700) was researched by Morag Cross and assessed in conjunction with Tom Addyman. Overall this exercise revealed a great wealth of documentation, individual discoveries including mention of a drawbridge, an inventory of armaments of 1680, a plan of part of the castle of 1700, and references to a variety of ancillary buildings within the enclosure walls and beyond. The fabric analysis confirmed an extremely complex and convoluted history and evolution. The origin of the structure was considered to be mid to late 13th-century, perhaps c 1260-5 as suggested by the historical study. 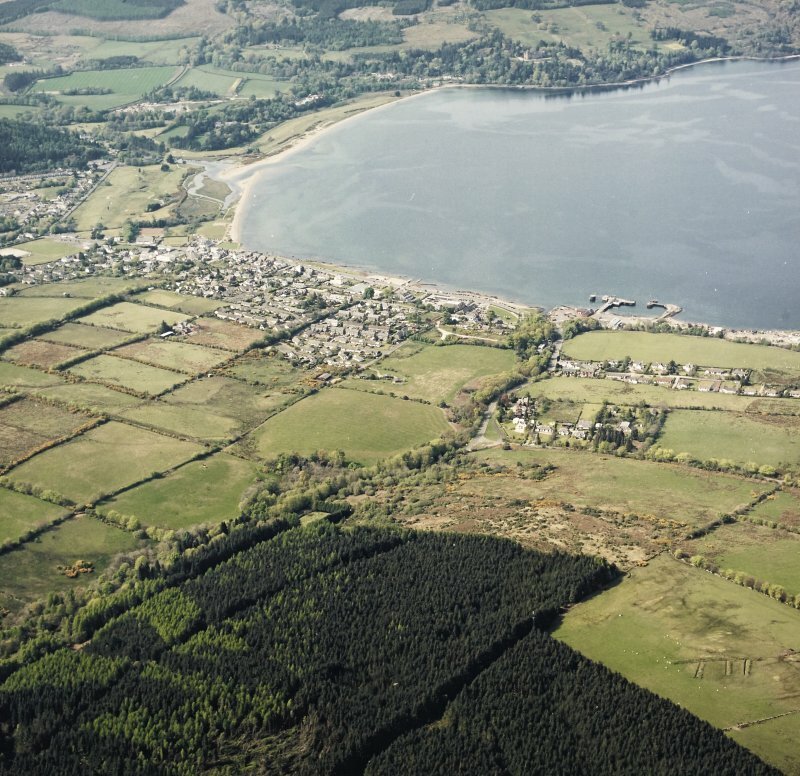 In contrast to the slightly earlier Lochranza Castle at the N end of the island, which displays many of the attributes of early stone castle building of the W seaboard, Brodick appears firmly associated with the mainland castle building tradition of the kingdom of Scotland, with details comparable to sites such as Bothwell, the secondary phase of works at Skipness, Loch Doon Castle, and others. The early castle seems to have consisted of a rectangular wall of enclosure bounded to the N and NW at least by a rock-cut ditch. The S and E walls remain; the N wall survived into the mid 19th century. The enclosure wall was pierced by a simple principal entrance to the E that was flanked on its N side by a substantial round tower. The remains of the latter preserve a solitary fish-tail crosslet arrow loop (recorded by the RCAHMS in 1977); the N side of this tower was depicted in 1844, just before its removal. It is likely that the lower E part of the principal range of the castle was the site of the main accommodation and may still incorporate the remains of a principal hall over a basement level. This block was accessed at its NE corner by the existing substantial turnpike stair. The first major addition was a massively constructed barbican built against the enclosure wall entrance. The remains of this feature are now substantially truncated to the E. The surviving details of the barbican, including deeply chamfered arch ribs, suggest that it too is of early date, perhaps of the later 13th or 14th century. There was evidence for extensive physical damage to this earlier castle in a number of areas, particularly to the SE and E exterior. Evidently as a consequence of this damage, the pre-existing buildings saw major repair and the replacement of the exterior masonry skin in a number of areas. This work was associated with the provision of wide-mouthed gun loops. Much of the upper part of the castle was reconstructed at this stage, with the existing corbelled battlements, saddle and trough parapets, bartizans and crow-stepped garrets, all suggesting a mid 16th-century date. The ground floor vaults in the main block are likely to have been inserted at this stage. The substantially constructed pine roof of the principal block seems also to be of this period. The E end of the barbican was reduced and the structure rebuilt in the form of a gatehouse. 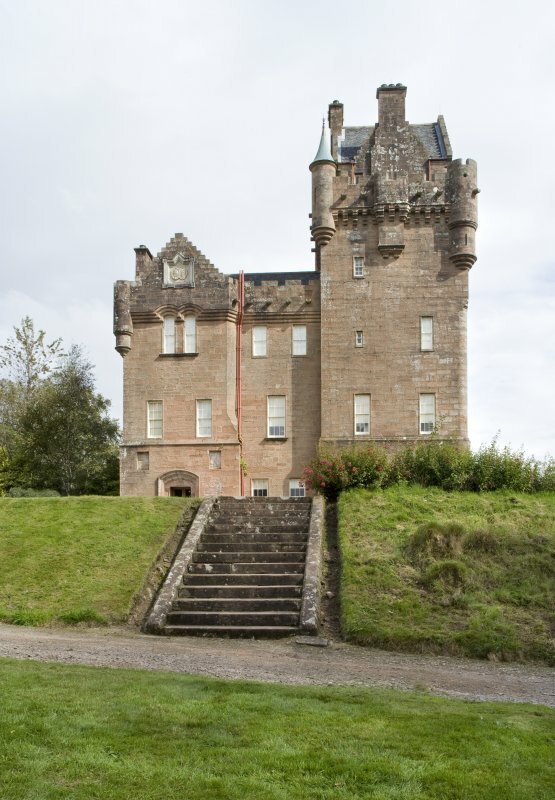 The early round tower was reduced to two stories and its W side and new upper levels built on a rectangular plan - a new N-S aligned range that extended back behind the gatehouse and incorporated an additional pend behind the original entrance. Subsequent works included the addition of the existing 'Cromwellian battery' to the E end of the gatehouse. It seems that the vaulted interior of this structure may be secondary to the outer walling. The principal block of the castle was doubled in length by an extension to the W; much of its roof structure is still remaining, but of much less substantial construction than the earlier one to the E. This work may or may not be associated with a Cromwellian occupation. The crow-stepped upper storey of the gatehouse may also have been added at this stage. Various minor secondary remodellings that were noted correlate well to repeated documentary references for repairs in the later 17th and 18th centuries. Substantial refurbishment occurred towards the end of the 18th century and at the beginning of the 19th, at which stage the still water-filled relict moat was in-filled (1813). Correspondence relating to the 1843-5 reconstruction of the castle by James Gillespie Graham for the Marquess of Douglas and Clydesdale, his wife, Princess Marie of Baden, and the 10th Duke of Hamilton was identified and the progress of the construction programme, including a major collapse, charted. 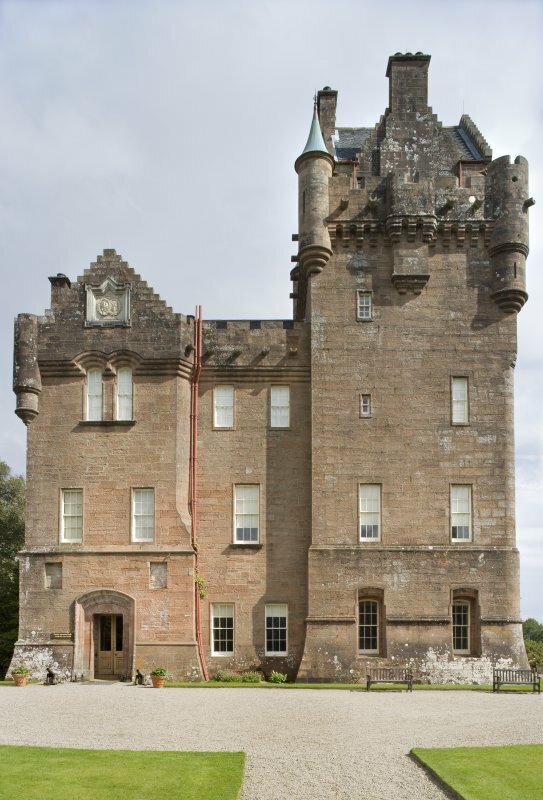 A close parallel to the castellated exterior of Brodick was found in Graham's earlier recasting of the W wing of Taymouth Castle (c 1839), and in his subsequent central block of Ayton Castle, near Eyemouth (1846). 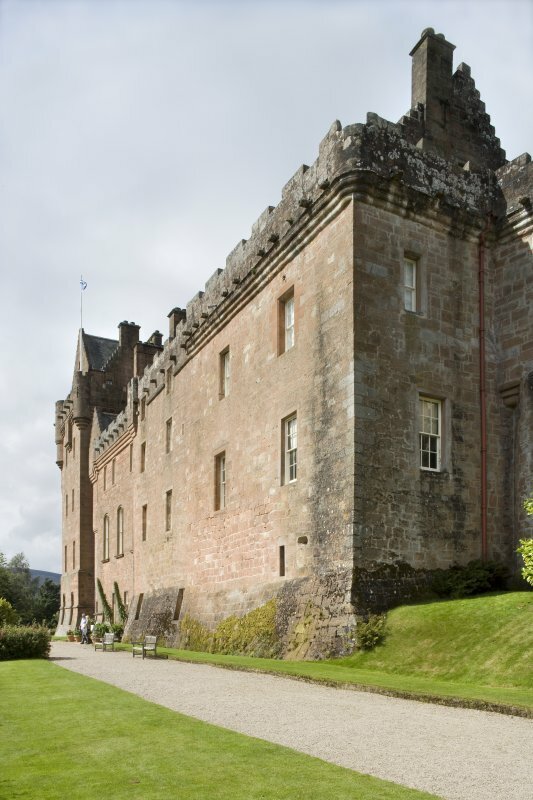 His design at Taymouth may have been directly influenced by Pugin, who collaborated with him there, with details ultimately derived from drawings of an as yet unidentified chateau in Normandy. Assessment was also made of later unbuilt schemes for the castle and immediate surroundings - by WA Nesfield (c 1852), William Burn (1856-60), WJ Green (1874-5) and Reginald Blomfield (1919), as well as a wealth of estate archive material relating to the later 19th and earlier 20th centuries. 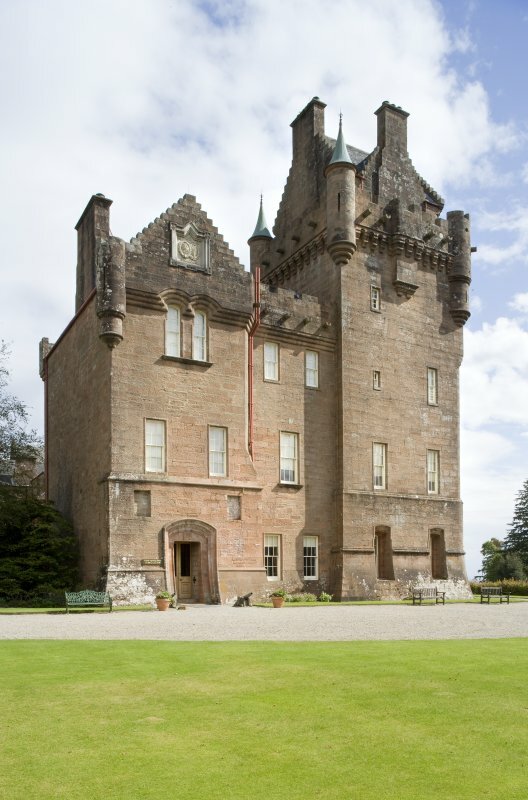 Much of the survey recorded the existing baronial mansion, its well-preserved interiors, its original planning and function, and subsequent evolution. Very extensive repeated change was recorded in the service areas in particular, much of it relating to rapidly evolving heating technologies, water provision, cooking and laundry systems, sanitary developments, and so on. 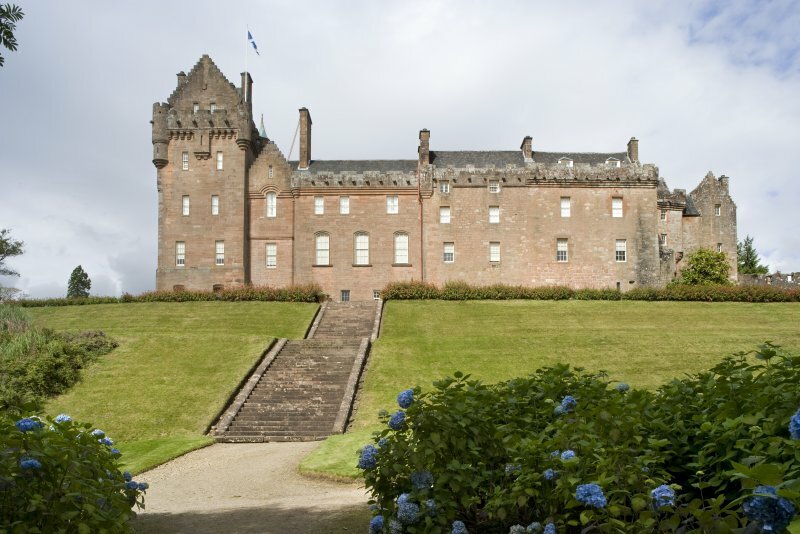 Oral testimony of Lady Jean Fforde, last member of the Montrose family to have lived in the castle before its acquisition by the NTS in 1956, was recorded on site. Report lodged with NTS and SMR. 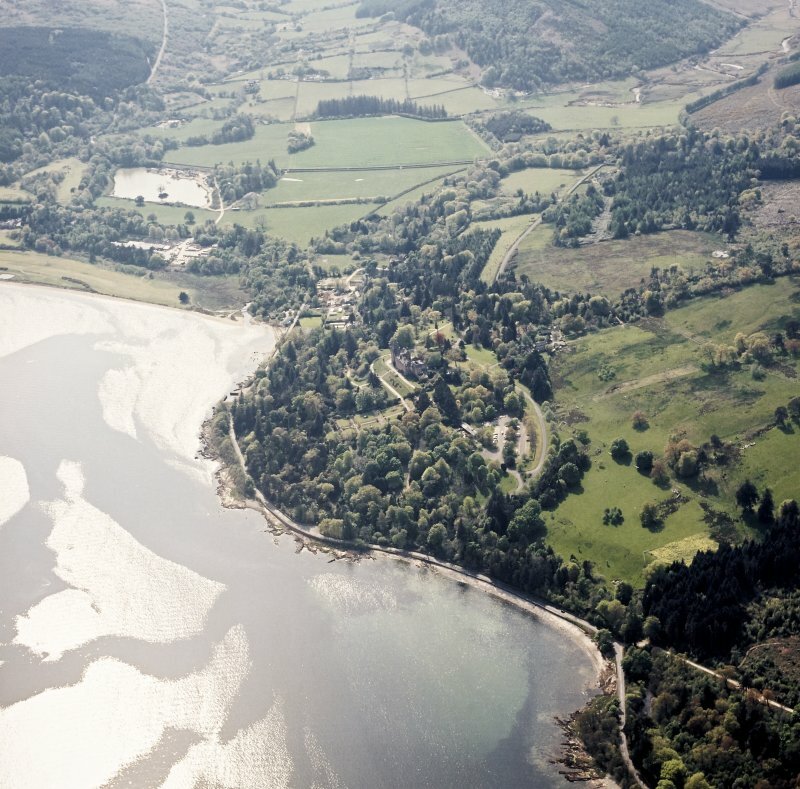 Two separate programmes of small-scale excavation work to the north-west of Brodick Castle. The work was undertaken to look for traces of the large ditch that had surrounded the medieval castle. During April 2003 volunteers on a Thistle Camp excavated a trench between the trees to the north-west of Bobbie's Buildings. Although nothing structural was found, sherds of 13th - 14th century medieval pottery were recovered. In the following year, in March 2004, a mini-dgger was used to excavate four small trenches in the road leading to the back courtyard of the castle. The results were limited by the depth to which the machine could excavate but clearly showed the natural subsoil sloping steeply downwards just in side the gateway, where large cracks in the wall on either side had suggested a degree of subsidence. This was clearly the edge of the medieval ditch and contained large quantities of building rubble. Future work could include the use of Ground Penetrating Radar to locate the ditch and further excavation trenches. 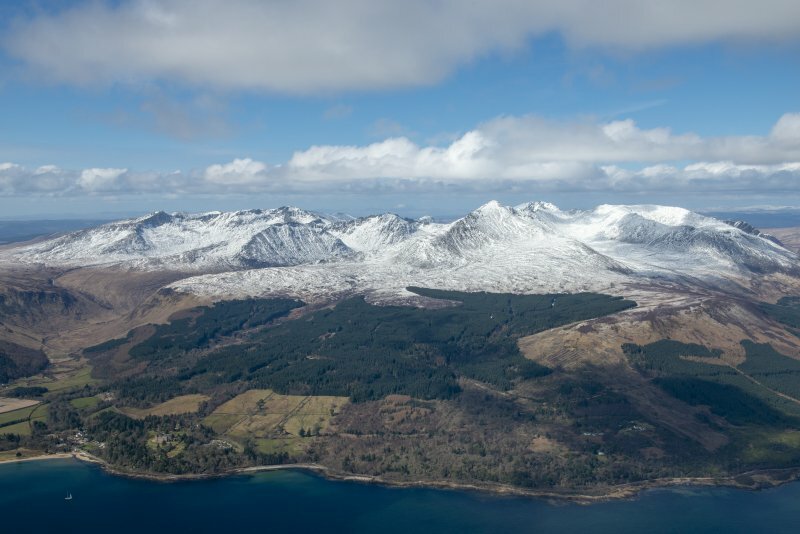 Sponsor: The National Trust for Scotland. 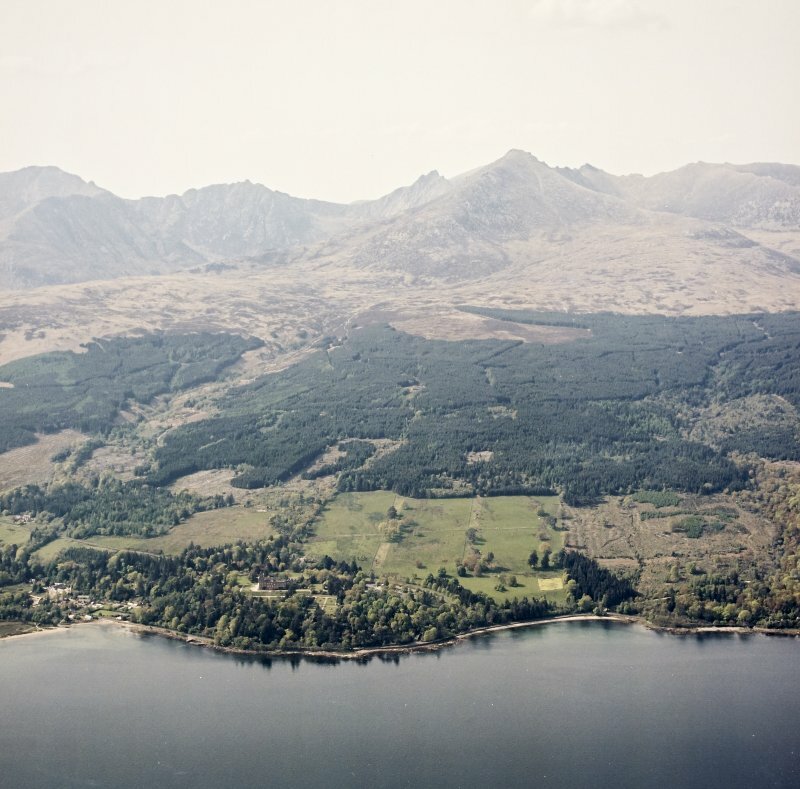 NS 0115 3805 An archaeological watching brief was conducted during the construction of a replacement waterpipe for the hydro-electric scheme at Cladach Mill, Brodick Castle, on the Isle of Arran. A new pipe was inserted into a trench parallel to the old pipe. A swathe up to 7m wide was stripped of topsoil by machine. Part of the way up through Greenhyde Field, on the north side of the exit drive from the castle, a small assemblage of chipped stone was recovered. This was located on a slight rise in the field (NS 0115 3805). Upon excavation it was found to that the flint was within the fill of a 19th century field drain which contained a clay pipe. Despite excavating out the upper fill of the drain no features were located which contained flint and could have been truncated by the construction of the drainage ditch. The assemblage contains about 30 pieces and includes a flint scraper, a core, chunks, flakes and blades, and some quartz. It seems likely that the chipped stone must come from a feature within the immediate vicinity. D Alexander and D Gorman December 2006. Thomas Browne - Edinburgh, 20th April 1844. 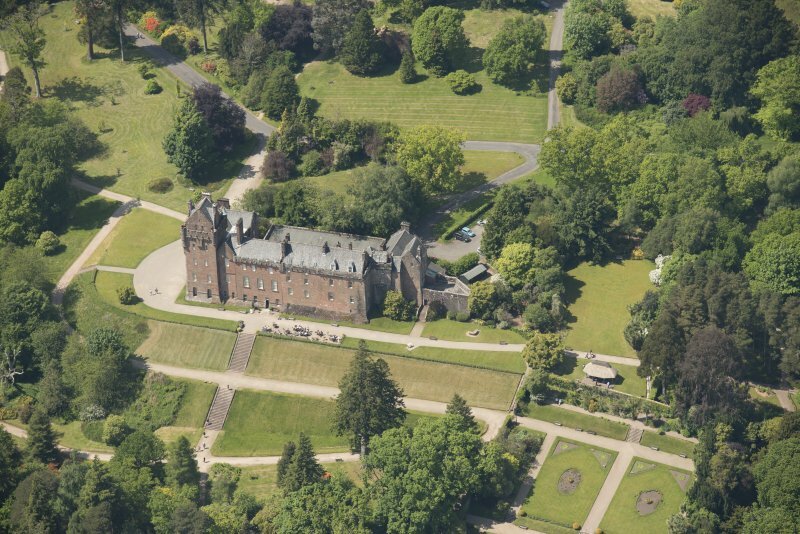 Contrast and agreement for building the additions to Brodick Castle. Elevation. Hothouses for garden (paper dated 1859). 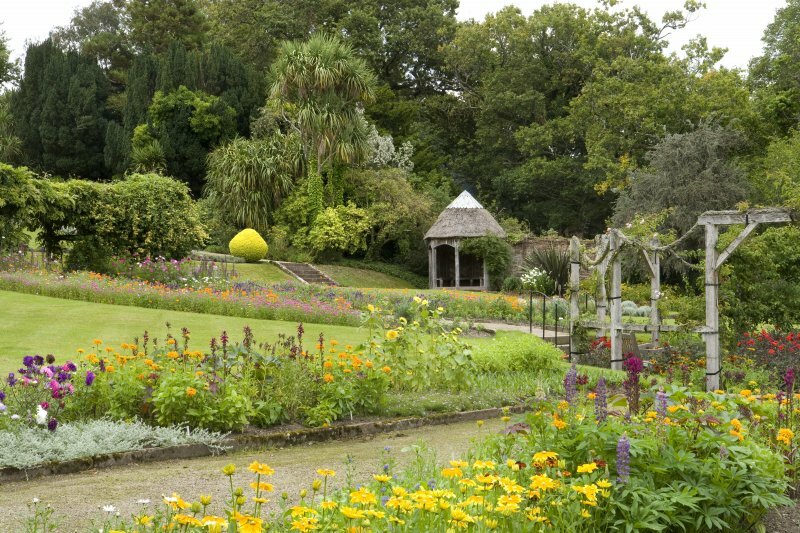 1 Proposed flower garden in connection with Observatory on site of present garden. W A Nasfield, 3 York Terrace. Regents Park 1852. 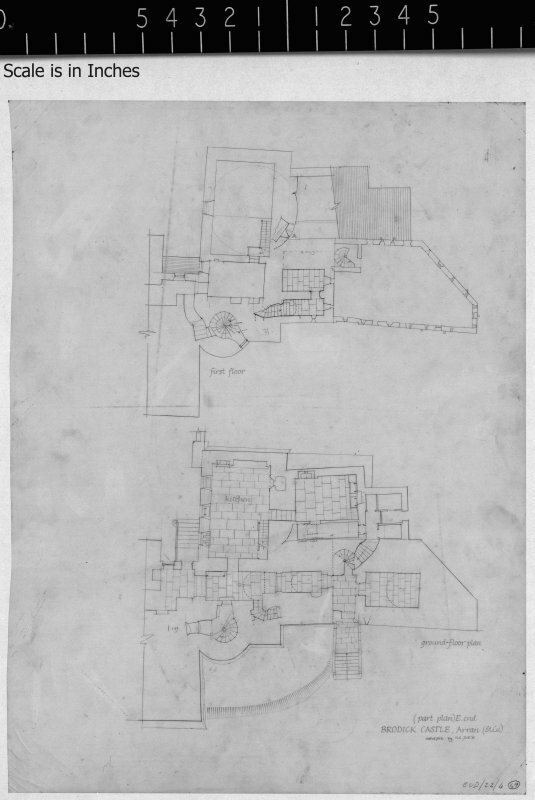 2 Plan of details - W A Nasfield, 3 York Terrace. Regents Park 1852. Brodick Castle is reputed to be the oldest habitable property belonging to the National Trust for Scotland, and the earliest portions date to the 14th century. 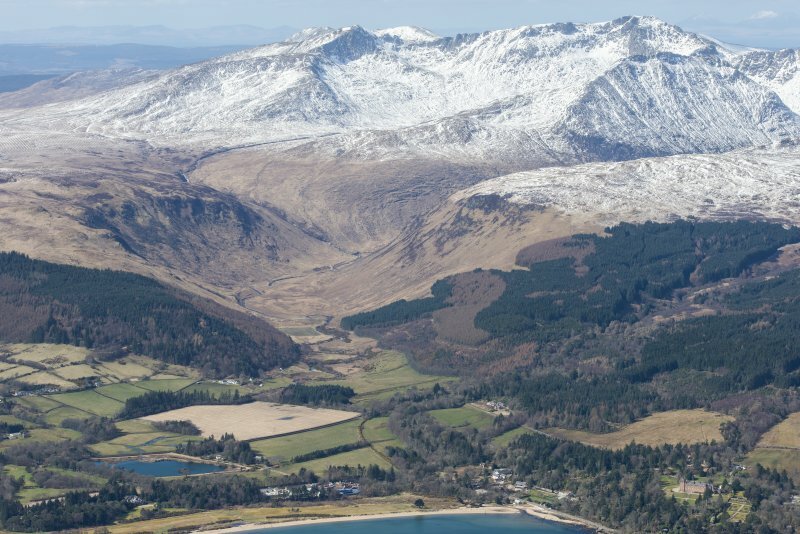 For the greater part of its history it was owned by the Hamilton family who acquired the estate and title of Earls of Arran in 1503. 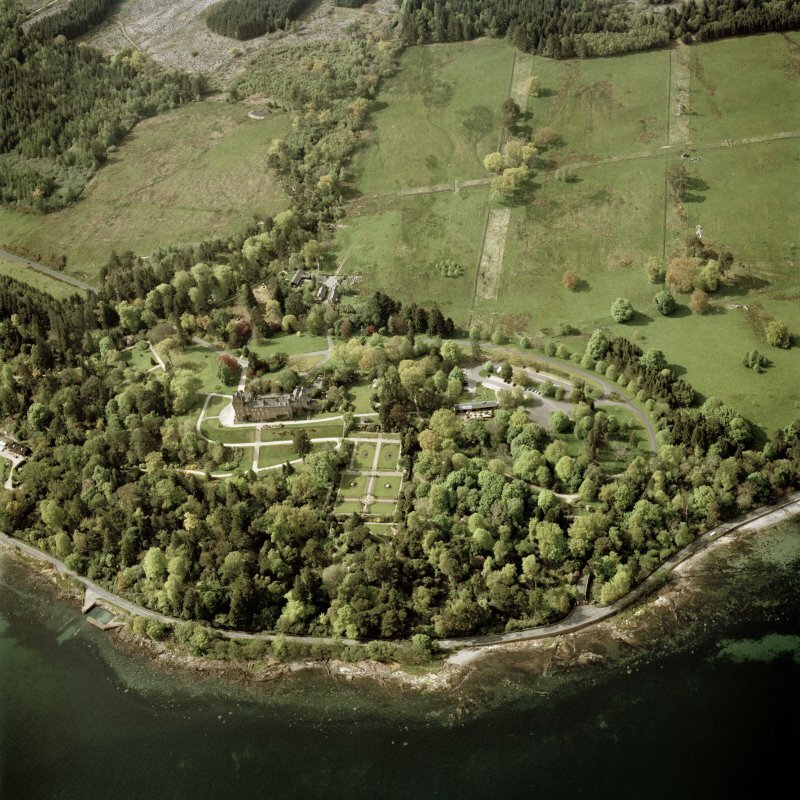 The castle and estate, which includes Goat Fell, passed to the National Trust in 1958 and it is renowned for its collection of art treasures and magnificent gardens. 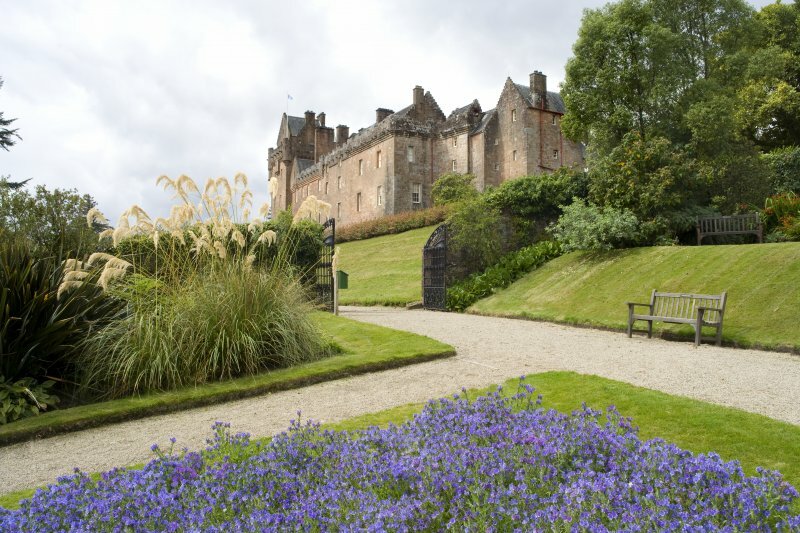 Little of the castle's medieval work can now be identified and, as it stands today, the castle belongs to three main periods. A 16th century tower-house forms the core of the building, to which Cromwell's troops added an extra wing and an artillery battery following their seizure of the island in 1652. 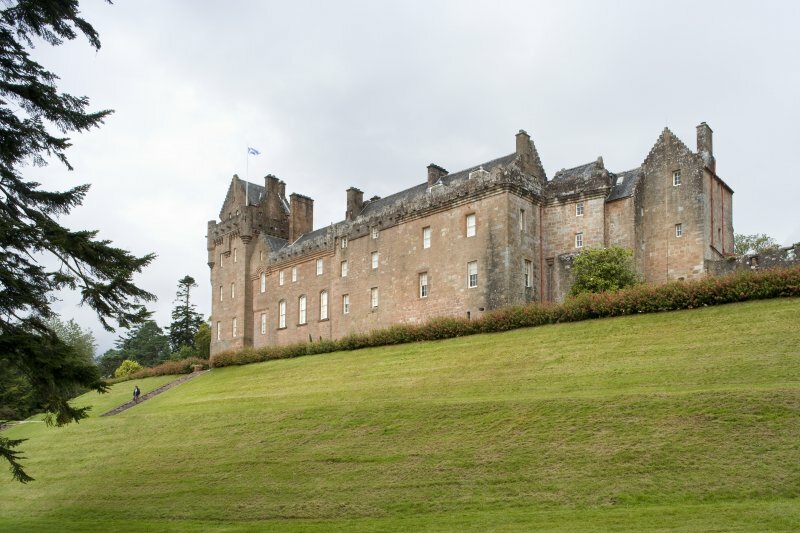 The west wing, which forms the largest section of the castle, was not built until 1844; it was designed by James Gillespie Graham, one of the most important Scots architects of the day, in what has now become known as the Scots Baronial style, and it marked a significant move away from the classical or Gothic styles that had been fashionable up till that date. Gillespie Graham's outwardly austere addition blends sympathetically with the earlier parts of the castle and contrasts with the richness of the interior decoration and furnishings, some of which were brought from the collection of William Beckford following his daughter's marriage to the 10th Duke of Hamilton. 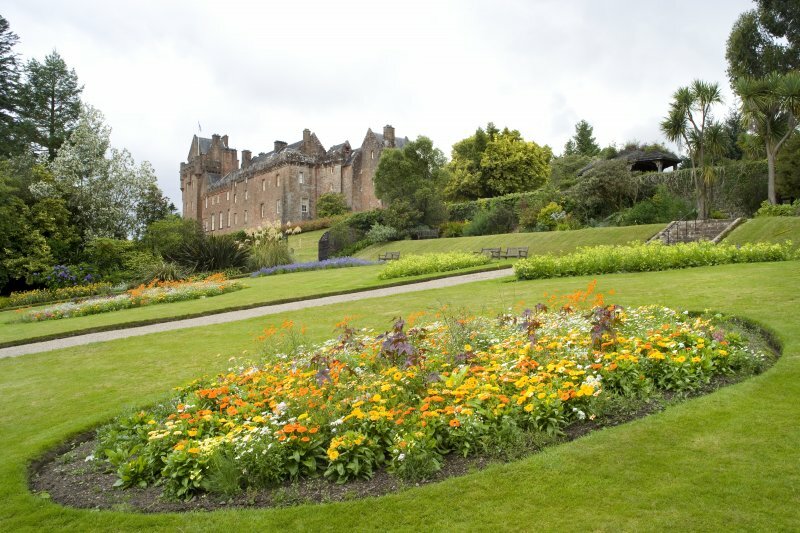 The gardens, which account for much of the attraction of Brodick, are laid out around the castle. 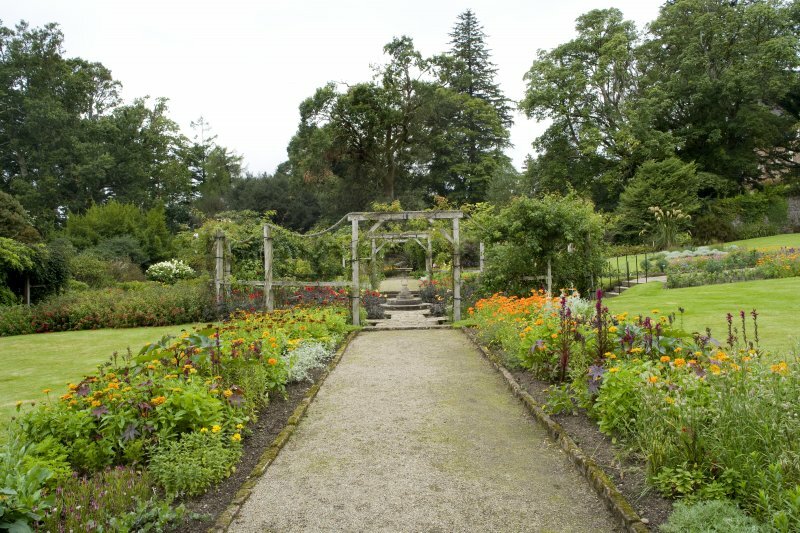 To the north there is a walled garden of 18th century date entered through fine wrought-iron gates, and in front of the castle a semi-formal area was laid out in the 1920s, which provides a splendid setting for the house. 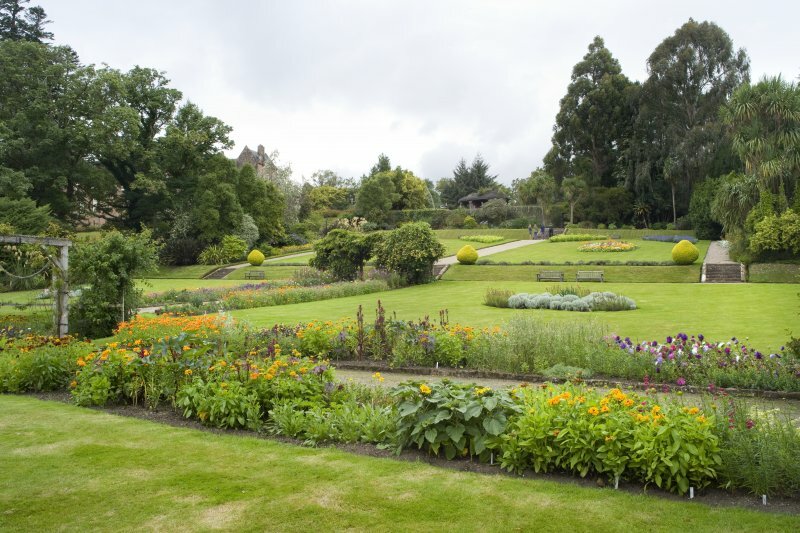 These terraces and beds give way gradually to wodland gardens with fine specimen trees and an important collection of rhododendrons which are in flower from February/March through to June. 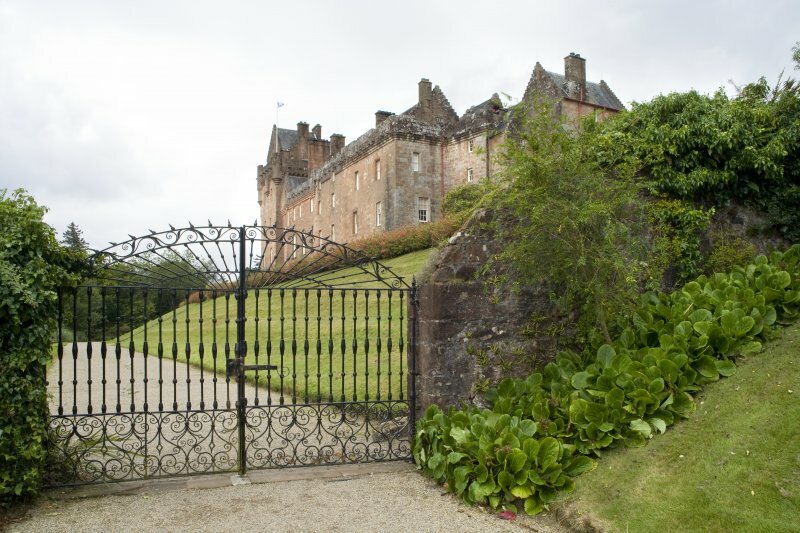 A brief external survey of Brodick Castle and its walled garden was made by RCAHMS survey staff whilst visiting Arran to record other sites for the Threatened Building Survey programme. 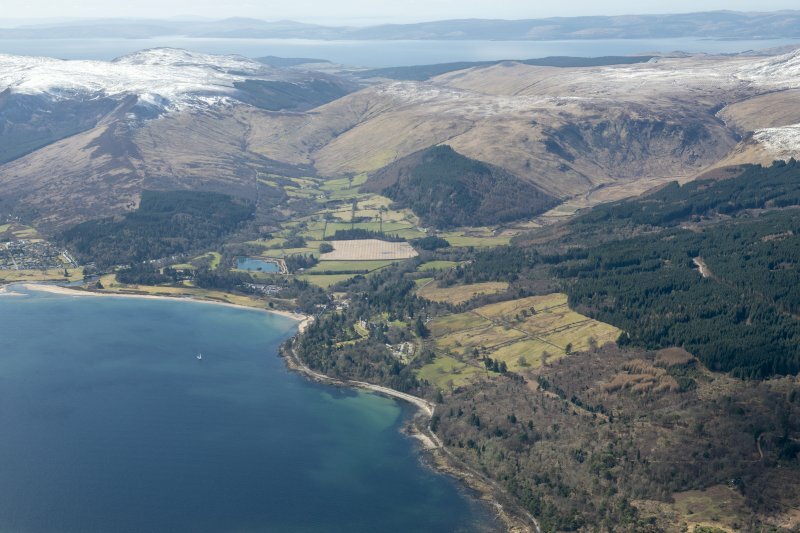 Archaeological monitoring work was carried out for the National Trust for Scotland in the grounds of Brodick Castle, Arran. 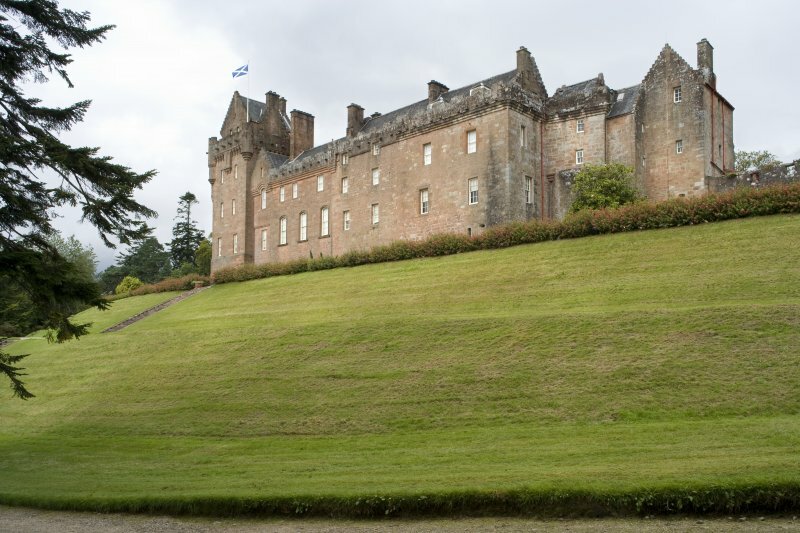 These works comprised the digging of two small test pits for the installation of lightning protection at the castle building itself, and the monitoring of eight trenches placed along the line of an existing water pipe in order to locate and repair a breakage. 19th century levelling deposits which incorporated material derived from the medieval castle were uncovered in two trenches located north of the courtyard buildings, and it is likely that one of these trenches was located on the line of the medieval ditch known to survive in this location. No previously unknown significant archaeological features were, however, identified, and no artefacts recovered during the course of the works. 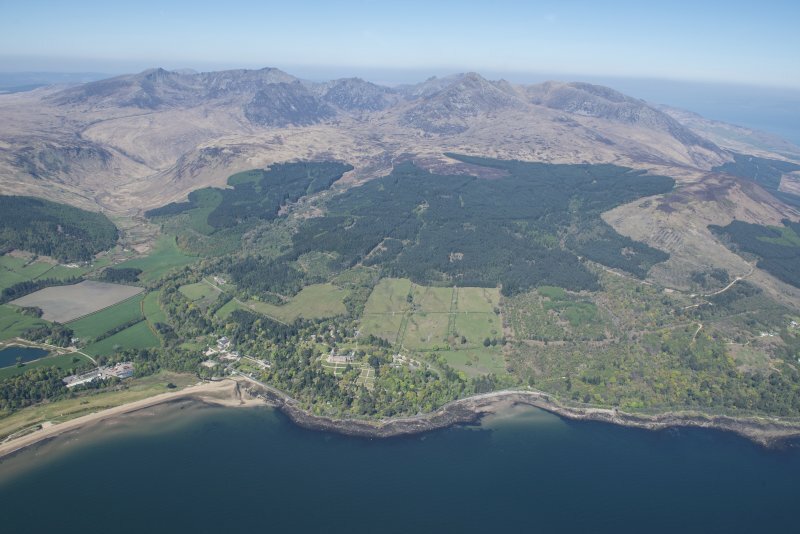 This Data Structure Report has been prepared for the National Trust for Scotland to report minor archaeological works undertaken in the grounds of Brodick Castle, Arran. 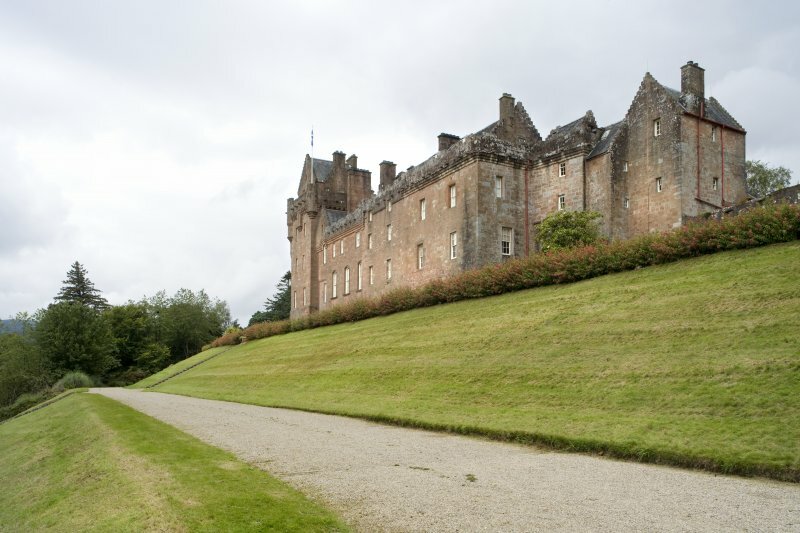 These works were in support of new signage around Brodick Castle. The archaeological works were designed to mitigate any adverse impact on the archaeological remains within the affected areas. In total, eight pits were excavated, seven by hand one by machine. These identified layers relating to previous phases of landscaping and improvement. No other significant archaeological features or artefacts were identified.